Land Rover BAR got off to a solid start in its quest to claim the 35th America’s Cup, ending the opening day of the Louis Vuitton America’s Cup World Series Portsmouth in the lead, but only by a slender point ahead of Emirates Team New Zealand. After Friday’s heinous conditions and incessant, torrential rain, Saturday dawned more positively with the Hampshire venue steaming slightly as the July sun dried it out and spectators in their tens of thousands descended upon the giant venue, that spans 2km of Portsmouth and Southsea shore between the Portsmouth Naval Dockyard to the spectator area compete with giant tiered seating along Southsea’s Clarence Esplanade. The latest ‘standard format’ for the Louis Vuitton America’s Cup World Series confines racing to just two days over one weekend and with just two races per day. This is mainly to fit in with television schedules – in contrast to the Extreme Sailing Series which aims to shoehorn in as much racing as possible. Spectators, both VIPs and corporate guests, along with the general public that had gathered along the Southsea shoreline and on the giant assembled spectator fleet, were able to view the complete race course. In a puffy, patchy 8-12 knots of westerly breeze, once again the 'new format' America’s Cup courses were used with reaching starts, then a two lap leeward-windward course, finishing off with a final run and a surprisingly tight reach into the finish line – the whole deal lasting only around 30 minutes. The only oddity was the course was set up with a start reaching on starboard tack followed by a starboard first mark rounding. In the first race the America’s Cup defender Oracle Team USA found a gap to cross the line at speed just above Artemis Racing and Land Rover BAR at the pin. The race to the reaching mark seemed longer than in past America’s Cup World Series races, perhaps a ploy by the Iain Murray-led race committee to play it safe in the LVACWS’ first regatta on foiling boats. Rather than being a pile up, like the first corner in a Formula 1 race (as it was designed), the first mark was relatively sedate with the US team, with Jimmy Spithill once again on the helm, rounding first and bearing away while Emirates Team New Zealand, with Glenn Ashby nominally skipper and under new helm Peter Burling, the only boat that immediately gybed. This proved significant with the Kiwis finding better pressure on the left of the race course, elevating themselves from zero to hero on the run. However steaming in from astern was Land Rover BAR which, significantly, was the only AC45 team to hoist the hard-to-handle Code 0 on the run, which Ainslie subsequently believed had paid as the wind dropped coming into the leeward gate. 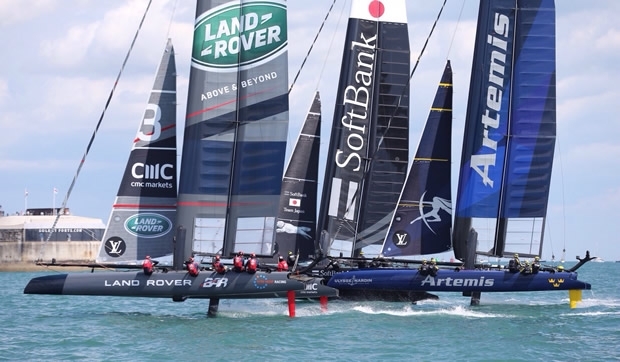 The Brits were followed by another new team, SoftBank Team Japan holding third, and then Artemis Racing, Oracle Team USA and Groupama Team France. On the first beat, the boats on the right were able to regain some ground on the race leaders, but the Kiwis maintained their lead over Land Rover BAR with Artemis Racing plummeting to last place and Oracle Team USA up to third. For the second run the wind had dropped to around 8 knots with all the boats flying gennikers and in the latter stages Land Rover BAR was able to slip ahead of Emirates Team New Zealand to gain the lead going into the second leeward gate rounding. Behind Oracle Team USA was holding third with Artemis Racing overhauling Softbank Team Japan (which suffered a terrible furl on their Code 0, although thi shad no repercussions later), with Groupama Team France bringing up the rear. Ben Ainslie and his crew extended on the beat and finally for the last run spectators were treated to some proper foiling with the wind back up above 10 knots and the boats fully foiling. While the British team hung on, at the leeward gate, Oracle Team USA came charging in on port for a close final leeward gate encounter with a down speed Emirates Team New Zealand, causing protests from both boats that were both politely green flagged by the umpire team. Rounding the mark on the outside, Oracle Team USA was able to roll past the Kiwis on the final reach into to the finish to claim second. Behind, the Dean Barker-steered Softbank Team Japan recovered fourth place from Artemis Racing. After a short wait for the boats to return up the race course and to change corporate guests (still perched precariously on the netting aft of the rear beam as was the case on the AC45 before they went foiling…), race two got underway in similar light to moderate breeze. In this Land Rover BAR made the best of the start to lead into reaching mark. The call was made to gybe immediately, as the Kiwis had done on the first run of the previous race with devastating effect. However this time it definitely did not pay and it was once again the Kiwis, with the eminent Ray Davies hiking hard and calling tactics from forward of the front beam, that made the right call to bear away rather than gybe at the reaching mark. The three boats that went this way pulled into the lead on the run with Groupama Team France pulling into second with Softbank Team Japan rounding on the outside of Land Rover BAR with Artemis Racing ahead of Oracle Team USA, residing in an uncharacteristic last place. There was a brief moment of euphoria for the French as Franck Cammas’ team momentarily pulled into the lead at the top of the beat, but with Groupama having to put in an extra tack, the Kiwis held on and were never again threatened, despite Cammas splitting from them on two subsequent mark roundings. Artemis Racing wasn’t having a good day. Fifth in the first race, she accidently blew the halyard for her Code Zero that dumped itself on the deck coming into the leeward gate. As the dumbfounded crew struggled to get it under control, they dropped into last place from which they were unable to recover. However Land Rover BAR was on a charge and slowly pulled up to third, ultimately overtaking Groupama Team France on the final run. The British team was able to hold second behind Emirates Team New Zealand into the finish, her 1-2 result causing her to top the leaderboard at the end of the opening day of the Louis Vuitton America’s Cup World Series Portsmouth (although not technically the half way stage as both of tomorrow’s races count for double points). Coming ashore Ben Ainslie was pleased with his start of this regatta, which in reality, albeit in the most minute of ways, marks the beginning of the road to the 35th America’s Cup. Although it varies depending on the number of teams, the winner of the Louis Vuitton America’s Cup World Series (ie the tally of all the events between now and 2017) can claim two points going into the start of the America’s Cup Qualifiers in June 2017.